Want to know when the next Household Hazardous Waste drop-off day is coming up? How about a quick text or email about trash day — the day before, so you don’t forget? Sign up for reminders from Rogue Disposal & Recycling and we’ll let you know. Choose from text, phone message or email reminders — whichever delivery method works best for you. And by enrolling in reminders, you also automatically receive service alerts too. Sign up here. Sign up for alerts from Rogue Disposal & Recycling and we’ll notify you when there are weather-related issues (like icy roads) or service delays. Alerts will let you know about major program changes too — with a simple message sent straight to your email box. Sign up here. Have something you want to dispose of or recycle but you’re not sure how? Forgot if this is red-lid or green-lid recycling week on your street? Now there’s a Rogue Disposal & Recycling app for that! If you have a smartphone, go to the App Store or Google Play Store, search for the “Rogue Disposal Mobile” app and download it — free! And that’s just the beginning! 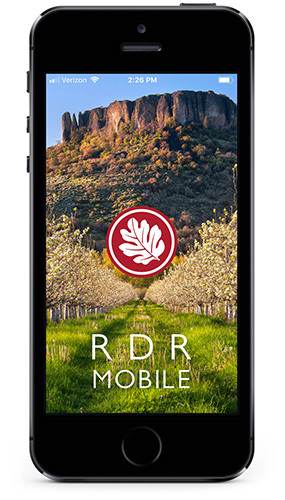 You can also use the RDR App to find out how to dispose of household items. Anytime you have something to get rid of but you’re not sure how, just type in the name of the item (like corrugated cardboard, glass jars, egg cartons or batteries) and click “search.” It’s that easy. Depending on the item, you’ll learn whether it belongs in the recycling roll cart, the yard debris roll cart or the trash … whether there are drop-off options … and any other services or options that may be applicable. It’s a great way to get all the trash and recycling resources you need, right at your fingertips.